BOGOTA, May 9 2013 (IPS) - “I was displaced here by mining a month ago. Illegal miners forced me out of my municipality. No, don’t write down where I’m from, let alone my name,” said a 40-year-old black man frightened for his safety. IPS agreed to say only that he is from Colombia’s southern Pacific coast region. Two leftwing guerrilla movements are active in the biodiverse area between Colombia’s Andes mountains and the coast. The larger group, the Revolutionary Armed Forces of Colombia (FARC), is currently engaged in peace negotiations with the government of conservative President Juan Manuel Santos, and the smaller one, the National Liberation Army (ELN), is expected to start peace talks soon. Far-right paramilitary groups are also operating in the region, termed by the authorities “bacrim” (from “bandas criminales” or criminal bands), after the demobilisation negotiated during the administration of former rightwing president Álvaro Uribe (2002-2010). The paramilitaries are the only armed sector that is growing in numbers. The illegal armed groups are now involved in artisanal gold mining, which has long been practiced in the area. Production and trafficking of cocaine are apparently in decline in the south of the Pacific coast region. “Gold is the business now,” the displaced source said. He said gold generates between 13 and 23 times more net profit now than cocaine in the southwest of Colombia, near the Ecuadorean border. But to extract gold, initial capital is needed. And mining brings conflicts in its wake. In the last 20 years, Colombia has been transformed radically, as it became a mineral and oil producing country. And its institutions have not yet adjusted to the new reality. These are the conclusions arrived at by experts who talked to IPS at the presentation of “Minería en Colombia: Fundamentos para superar el model extractivista” (Mining in Colombia: A basis for improving the extractivist model), the most complete study to date, and the first of a series of reports from the comptroller-general’s office, the country’s highest fiscal control agency. For six months, economist Luis Jorge Garay led the group of co-authors, made up of experts Julio Fierro, Guillermo Rudas, Álvaro Pardo, Fernando Vargas, Mauricio Cabrera, Rodrigo Negrete and Jorge Espitia. The speakers during the Monday, May 6 launch of the report were former environment minister Manuel Rodríguez; Jorge Iván González, head of the National University of Colombia’s Centre for Economic Studies; and constitutional law expert Rodrigo Uprimny, head of the local NGO Dejusticia. The report “indicates that we are undertaking mining with very little regard for the enormous social and environmental costs involved,” he said. The 1991 constitution establishes a series of fundamental rights that have, however, been eroded when it comes to mining regulations. A government official can adopt a measure that runs counter to the constitution, but will take precedence in practice. Mining brings 1.1 billion dollars a year to Colombia, according to Morelli. “But the question is whether this sum is sufficient compensation for the impact of mining activity,” she said. 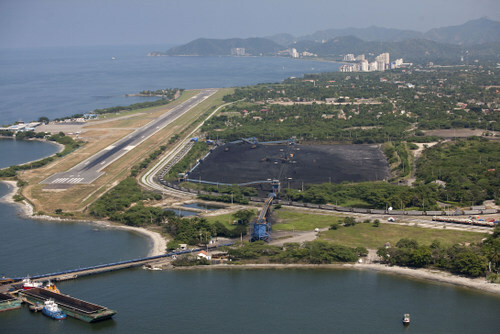 Colombia’s main mineral products are coal, nickel and gold, for which it is the world’s tenth, seventh and 22nd largest producer, respectively. “There is an idea in Colombia that foreign investment must be attracted by offering gifts. This is not true. Foreign investment goes where there are resources, but even more to where there are clear rules,” said Garay, who coordinated the study. “The report shows that mining, while it is promising, also entails enormous dangers,” said Uprimny. These range from environmental hazards, harm to indigenous and Afro-Colombian people, and disputes over land, to the possible intensification of armed conflict and forced displacement. The study “makes recommendations to strengthen environmental regulations and legal regulatory powers. It is a very important report in a country that has become a mining nation,” said the expert on constitutional law. “Environmental licences (to conduct mining operations) are given to anyone who asks; only three percent of applications are denied,” said Uprimny. The displaced man, who attended the launch of the report, is part of the affected minorities – and of the three percent who are refused mining licences. “Afro-descendant communities are not given mining permits. We are told that we do not meet the requirements,” he said. “In geographic terms, there is overlap of areas where displacement has occurred and where licences have been applied for or granted,” said report co-author Fernando Vargas, a lawyer and sociologist. “Especially in the ancestral territories (of indigenous and black communities), gold mining is generating extremely serious tensions and humanitarian crises, violations of international humanitarian law and serious and systematic violations of human rights,” he said.